Practicing phenomenological psychology, whether as a researcher or as a clinician, means learning a craft. Its raw materials are the descriptions given to us by interview participants—or, if we are psychotherapists, by our clients. Our “tools” derive from the well-articulated practices of Edmund Husserl’s phenomenology, adapted for use in psychological research by Amedeo Giorgi in a body of work spanning more than forty years. These include the phenomenological reduction, epoché, and imaginative variation (for a discussion of these, see Giorgi’s 2006 article in the journal Análise Psicológica [PDF]). Learning to take up these tools and engage with human science data in a sensitive, skilled way enables a psychologist to adopt a genuinely phenomenological attitude. Like any craft, phenomenological research places demands on the learner, requiring time and commitment. 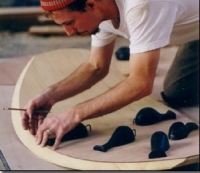 In this respect we can compare it to a highly skilled craft like wooden boat-building. A good friend of mine is a master instructor of traditional wooden sailboat building; he teaches students ranging from beginners to advanced apprentices. Having visited the school’s workshop in Sausalito, where the frames of new boats are taking shape amid the sounds of construction, I can appreciate the analogies with our work. One must get a feel for one’s materials and one’s tools, and through practicing with others, experiencing successes and failures, and dialoguing with teachers, learn one’s craft. Learning to build boats, one naturally recognizes that one isn’t the first person in the world to build a sailboat! Human beings have been doing this for centuries, so there is an accumulated body of intersubjective knowledge—a communal body of craft-knowledge—that one absorbs and draws upon, supported by mentoring and the community of fellow-learners. In this process, over time, one gains the foundation from which creative expression springs. For me, this process mirrors the lived-experience of learning to practice phenomenological psychology. The craft analogy comes to my mind spontaneously as I sit in a café, writing. Then, freely searching online, I discover that Elizabeth Behnke published a lovely essay last year titled “Working Notions: A Meditation on Husserlian Phenomenological Practice” in the book Advancing Phenomenology. She invokes the image of the master craftsman or craftswoman as a representation of the phenomenologist’s path of inquiry. Behnke points out that a one would never walk into a craftswoman’s workshop and assume that one understood what all the tools are for and how to use them. Some of the tools might initially appear familiar, but one would have to become a student of the craft in order to learn, through practice—and with guidance from the skilled craftswoman—how the tools are properly used. To do otherwise would yield a “boat” that likely wouldn’t be seaworthy. This feature of phenomenology has its detractors, however. Dermot Moran notes that hermeneutic philosopher Hans-Georg Gadamer criticized Husserl’s phenomenology as being too indebted to the Platonic, classical Greek model of “apprenticeship to the master,” with “a certain ‘craft-secret’ approach to passing on the method of phenomenology” (p. 244). However, it may well be that mentoring is an intrinsic requirement for the advanced practice of any discipline, including phenomenology. But our “secrets” are open secrets, hidden in plain sight. If one has chosen a challenging, alternative psychological method—of whatever kind—one’s likely to find oneself with a small group of peers! That goes with the territory; it’s not unique to phenomenology. As qualitative researchers, we are a distinct minority and are often perceived as marginal by mainstream practitioners. Living in this situation, we must naturally safeguard against becoming too insular, and continually reach out to the larger community, seeking genuine dialogue. Cross-pollination is critical and sustaining. At the same time, as Giorgi has remarked, as outsiders we face not only the challenge of adequately mastering our approach to research, but also, we are continually called upon by critical others to justify the basic premises of what we’re doing. These are creative challenges, if supported by a community of co-researchers—even if that community is relatively small!